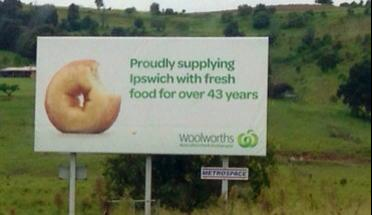 The advert, pitched along the Warrego Highway, displays a large image of a donut next to the words “Proudly supplying Ipswich with fresh food for over 43 years”. “Appalled” with billboard choice, Ipswich Doctor, Jason Maloo snapped a pic and publically shared his disapproval on the Facebook page of UK celebrity chef, Jamie Oliver. “Obesity comes down to poor food choices and bad eating habits, and if companies promote these sort (sic) of foods as fresh food, what hope do we have of fixing this problem?” Dr Maloo wrote on Mr. Oliver’s Facebook wall. “I sent it to him because he set up the Ministry of Food here, and I thought he might be interested to see what we are up against when trying to education people about good food choices”, said Dr Maloo. In just under 24 hours, more than 5, 400 Facebook users have participated in the “share and shame” campaign and Woolworths has agreed to take down the billboard. Ipswich was selected as the location for Oliver’s healthy meal program for Queensland based on the alarming obesity rate of 62.5 percent in 2010. “I didn’t feel the donut sign was a positive message and it kind of stereotypes Ipswich people as donut eating unhealthy members of society, which a few people in the thread have picked up on, said Dr Maloo. However it seems the public opinion of the words ‘fresh food’ have been misinterpreted from what the supermarket had anticipated. Dr Maloo says it’s a community effort to make sure there’s a unified effort to promote a healthy lifestyle. “They [Woolworths] do have other signs in this marketing campaign around Ipswich that show … apples, eggs, veggies, etc, and this is so much better than a donut. They send positive messages to people through their advertising” says Dr Maloo.